As promised, here is a new post for you! I wanted to catch you up on all I’ve been doing, but to be perfectly honest, I’ve been doing lots of little bits of much bigger projects. So, even though I have no awesome before and after photos of things, I can just touch on what I’ve been messing with and what I still need to do in order to cross the task off my To Do list. Let’s start our tour inside, shall we? The kitchen area really consists of three rooms: the kitchen, dining room, and what I call the family room. All three rooms have the same cabinetry, which is a nice quality wood cabinet. I imagine they looked awesome when they were installed 20 years ago. Now, they are a bit worn with quite a few scratches, and we’re even missing two drawers. (In addition to 20 years of wear and tear, a mischievous child carved his, er, their name into one of the drawer fronts.) One of the first things I wanted to do was change out the hardware. I wasn’t really digging the wood-on-wood handles and knobs, so I finally broke down and changed them with some awesome antique brass hardware that matches the front door hardware. The amount of cabinets and drawers in this area is astounding (as well as daunting; cleaning them is a multi-day chore). Even though we’ve had the house for three months now, I still have not gotten to cleaning all of them out. In my defense, I’m almost done, but not quite. I never really thought about what 20 years of dust, food, and random stuff accumulated at the bottom of a stack of drawers might look like, but now I know. It was pretty obvious that neither of the previous owners actually took the drawers out to clean behind them. In the entertainment center, I found a Sarah McLachlan cd, and in the kitchen, an unopened bag of seaweed cracker snack things. (I would not have touched those things had they been fresh, but my guess is they were closer to 15-20 years old, and they did not look yummy.) 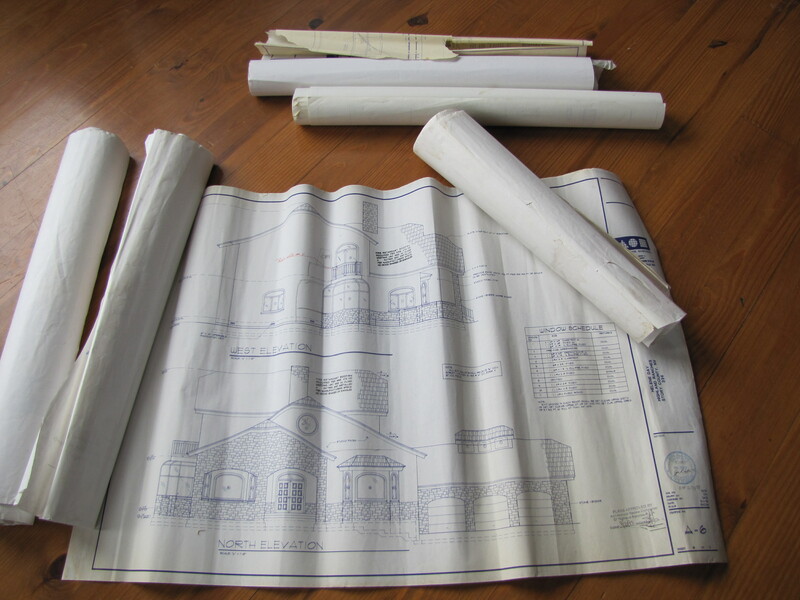 But, the most exciting thing I found was blueprints in the dining room. None of them seem to be complete, and they are certainly not the exact same plan as what was ultimately built, but they did answer some of our questions, i.e. what the heck is that weird enclosure thing next to the fire place in the middle of the house? Answer: iguana enclosure. Unfortunately, it doesn’t give us non-iguana owners any inkling of what to do with it. One of the other big To Do’s in the kitchen is getting an oven door. The Viking range that is in the house is awesome, but the gaping hole in the front is not. We will be getting another rack for the larger oven (because cooking one pizza at a time is just not cool), and a new control panel so we can actually see which knob does what instead of guessing. We were talking about maybe replacing the carpet in the two bedrooms downstairs early next year. Then Jeremy bought a UV light, and upon seeing how disgusting all of the carpet is, we have decided to replace all the carpet now. We’ve already picked out the carpets, even letting the kids pick out their own (and yes, the girls chose purple… sigh). We still have a couple of weeks before the carpet will be installed, and in the mean time, I will be focusing on PAINT! Jeremy is a servant to the gods of white walls, but alas, I am not. 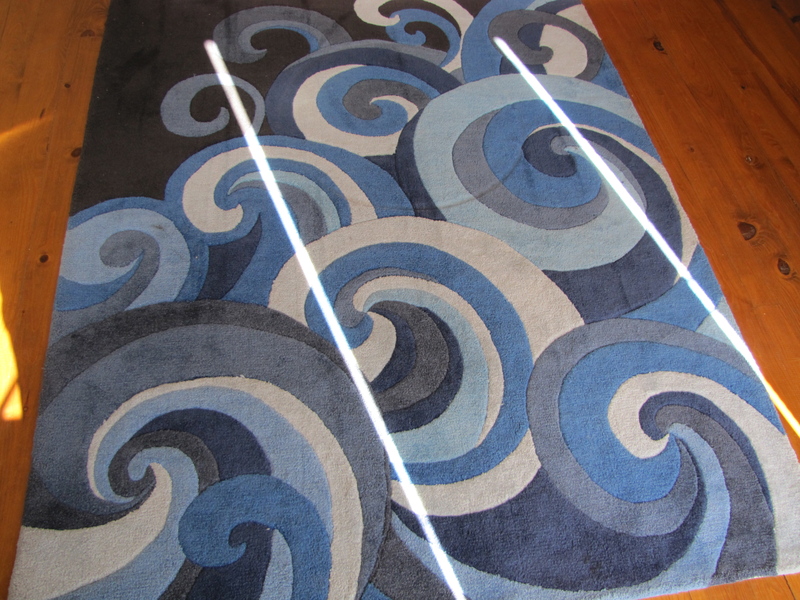 We found a rug for the office with multiple shades of blue making up a nice wave design, and I’ve decided that I will pull my paint colors from that. Matching the colors on the rug to the colors on those silly little paper paint samples has not been easy, but I have acquired a nice fan deck, and my time is running out. If all goes well, the paint will start to go up on the walls this weekend. It is going to be a lot of work, but the reward of not having to see the previous owner’s horrid paint choices will be well worth it. We have 10 acres to clean up, and the previous owners were kind enough to leave us lots to do. From a barn with stalls full of junk sitting on a foot of animal poop, to piles of concrete around the house, we have our work cut out for us. It’s finally October, and we will begin the task of trimming the trees to get any branches the recommended four feet off the ground, and really defining the 30 foot fire break around the house and propane tank. I have my work cut out for me in the multiple gardens that are currently around the house. I’ve mostly cleared the planter in the front of the house, and I’ve begun clearing most of the rocks, dead plants, and pieces of concrete away from the gardens behind the house. There are a few trees in the back that I have not been able to officially identify, except for one, a Santa Rosa Plum (nom nom nom). Unfortunately, it doesn’t look too happy (and I can only assume it’s because plum trees don’t typically thrive in desert climates), but I am hopeful I can keep it alive and get it to a happy place. The plum tree is the one in the middle. The tree on the left looks to have dark buds of some sort, but we’ll have to wait and see what it is up to. There is another tree off to the right of this picture that is already changing to a nice Autumn yellow. I am not sure what to do with this whole area in the back, but I’m thinking about maybe getting some nice gravel and/or paving stones. 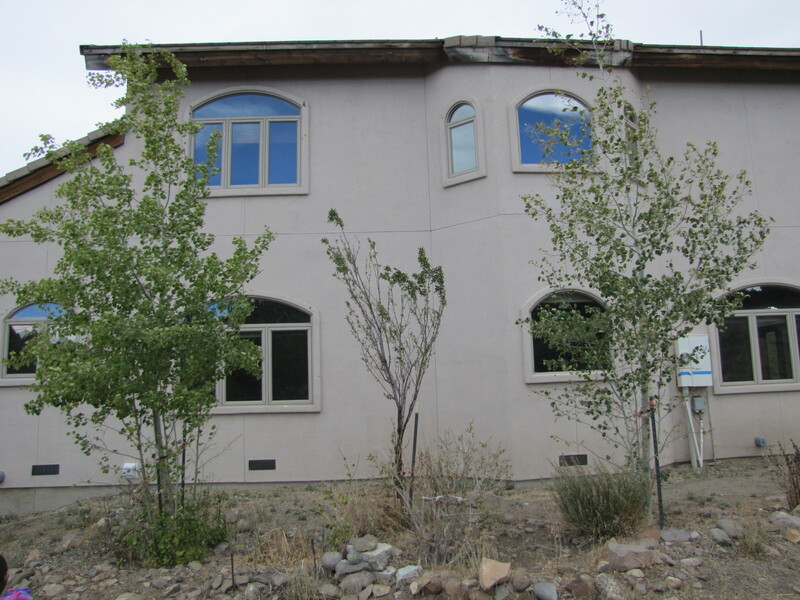 The garden on the side of the house will be completely taken out to make room for either a deck or a nice large patio area that will hopefully go in next year. The vegetable garden is a mess currently, and we are still bouncing ideas back and forth. What ever we decide to do, we will have to clear the whole thing and start fresh. The two rooms I am most excited to get to work in are naturally the two least important in the house: the living room and the lounge/library/my office. In the living room, we are planning on replacing the wold wood burning stove, and I plan to have fun decorating it. Also, this is the room where my piano will be, when I get an piano. The lounge is one of the rooms in the master suite, sharing the double sided fireplace with Jeremy’s office. I want to put in floor to ceiling shelving and somehow incorporate a desk in it for me. In order to get the shelves in, the wet bar will have to come out. (Removing a wet bar just feels so wrong, but I get more comfort from looking at shelves stocked full of my favorite books than an ugly, oddly placed blob of cabinets and green granite.) The couch and tv we currently have in CA will go up here when we move in full time, and hopefully soon after that the room upstairs will be a little slice of heaven for me. Basically, we have a lot going on. I have been working on this post for almost a week, and I’m still not particularly happy with it, but I need to get moving on my tasks I’ve set for this weekend. I am so excited to start slapping paint on the walls, and yet so very nervous because I’ve never painted walls before. Wish me luck as I venture into the unknown land of paint, and Jeremy luck as he enters the land of antenna installation!